Several cities in Iran’s Kurdish area were also the scene of a strike of small shopkeepers over the Iranian government’s closure of border crossings with Iraq and blocking of trading paths to Iraq. The government did this to prevent outflow of foreign exchanges, while the exchange flowing out in this way is tiny as compared to the regime’s wastage. The economies of these cities are mostly based on imports from Iraq. Rasul Khezri, an MP for the Kurdish city of Sardasht, said the blockade has destroyed the business of six million shopkeepers and caused the unemployment of 75,000 porters. 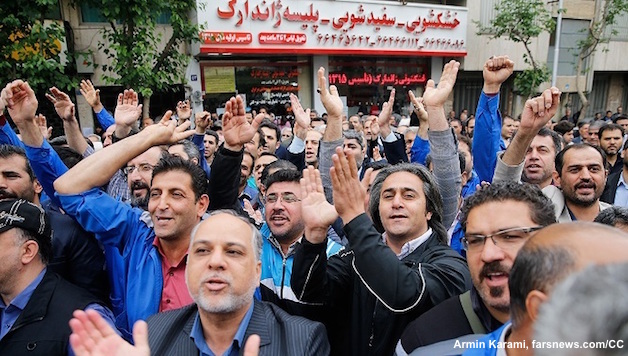 For the moment, workers of railway maintenance have gone on strike in different cities, while workers of Hepco Company in Arak blocked the railway to the city to compel the government to consider their demands. Thousands of workers who have not been paid for months can no longer tolerate the situation and this has risen the workers’ militancy. Rouhani’s administration tried to encourage manufacturing by reducing the interest rate to 15 per cent. What was the result in this “ailing” economy? They money poured into the foreign currency market and the rial exchange rate versus the dollar hit the record of 60,000. After employing the police and arresting street dealers and closing some foreign currency shops, the government announced the new rate of 42,000 rials. This was a cunning way to depreciate the national currency by about 20 per cent at the expense of the people. And this was an end to Rouhani administration’s promise that it would relax the government’s grip on the economy and would stimulate a boom. Musa Ghaninejad, a pro-capitalist liberal economist, described the government’s new policy “declaration of war against laws of economics” and a “a return to the rationing policies of 1980s”.Now, the regime has to increase interest rates even more or let the liquidity remain outside of its country. The main loser in Trump pulling out of JCPOA is the Rouhani administration that hoped to restore the crippled economy. The US’s withdrawal was a blow to Rouhani, and encouraged the hard-line faction to renew its attack on the moderate-reformist administration. Towards the end of May, the Assembly of Experts, a watchdog body which choses the Supreme Leader, blamed Rouhani for signing the JCPOA and said he must make an apology for the failure. The US withdrawal from the JCPOA has brought up new questions about Iran’s future, alongside new re-alingments in the world (which is beyond the scope of this article). For the Iranian left, the question is whether the regime is in the position to take advantage of the clash with the US to mobilise the masses behind it and lengthen its life. Perhaps the best evidence is to look at arguments by the regime’s factions. Moderates and reformists boast that Rouhani could save Iran from a possible war by reaching an agreement with the world powers. While hardliners deny such a threat exists and describe such scenarios as their moderate opponents’ propaganda used to intimidate people and win votes. The regime’s approach is two-sided. First, it really believes that the US is not in a position to engage in a new war, and, of course, some truth resides in this analysis. Another side of this analysis stems from a fear from a growing mass movement since last year. The regime does not have a plan to relieve the economic crisis and therefore it does not want to aggravate the situation by fear-mongering about a possible war. So, it tries to ensure the people that there will be no war, let alone capitalizing on war because the masses are fed up with the regime’s anti-American and anti-Western rhetoric.